A new start-up is allowing some Uber users to kill two birds with one stone: Hailing a ride while checking off their shopping lists. 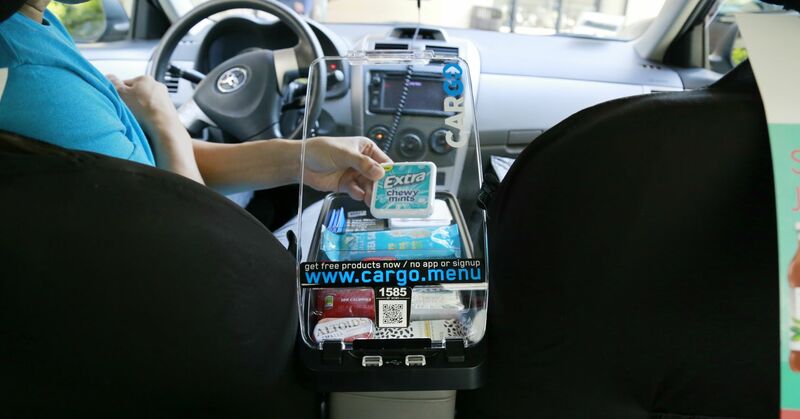 Cargo, a convenience store on the go, is giving Uber drivers the ability to sell items like snacks, beauty products and phone chargers from a console box located in the center of the vehicle. The company currently is active in nine cities, including New York, Atlanta, Dallas, San Francisco and Los Angeles. Through a partnership with Grab, Cargo currently has over 7,000 boxes on the road and is live in nine cities in the U.S. as well as internationally. In a few cities like San Francisco and Los Angeles, drivers are able to pick up Cargo at Uber’s Greenlight Hubs, where car operators come for on-boarding and personalized help. For its part, Uber hopes that the console, which is free for drivers to use, will help them earn extra income. The company, founded by CEO Jeff Cripe and Jasper Wheeler in 2016, raised their initial seed round, $1.75 million through Techstars. This year, Cargo raised an additional $5.5 million from CRCM Ventures and eighteen94 capital, part of Kellogg’s venture capital fund. In an interview, Cripe compared his product to Boingo — which provides Internet service at airports — and Panasonic Avionics, which allows video streaming on airplanes. And much like startups who disrupted airplane service delivery, Cargo hopes to achieve the same for cars, especially as the industry prepares for a driverless future. For now, the company sees itself as a provider of food, but in the future expects to branch out to entertainment and beyond. “You look at the airline industry and you think back to your last flight and you realize, ‘Wow, there was a big multi billion dollar company that provided me with all the snacking and beverage services on that flight.” Cripe told CNBC. Here’s how it works: Riders can download Cargo’s app, then must scan the QR or Snapcode on the driver’s console. They can also navigate to Cargo’s website to brows items specific to the car they’re in. The menus include a range of items passengers can buy, as well as free samples. After selecting an item, customers can checkout and the driver then hands them their purchase when it’s safe to do so. Customers can check out using Apple Pay, Venmo, Paypal, Android Pay, or by entering their credit card information. 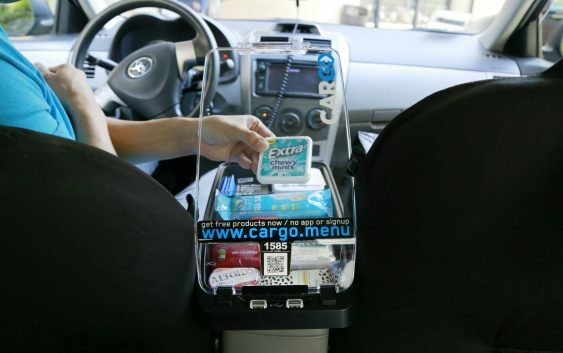 For now, only Uber drivers with a 4.7 rating or above (on a scale of 1-5) are able to add Cargo to their car. Drivers make $1 per purchase, and can pocket 25 percent of the item’s cost. They can also give out free samples to customers: About 1 percent of every box is filled with samples, and drivers make money even if only free samples are selected. The commission structure leads to Uber pilots making an extra $100 a month from Cargo on average, with top drivers making about $300, Cripe said. Cargo has established partnerships with Kellogg’s, Starbucks and Mars Wrigley Confectionery, and has sold over $1 million worth of items via the platform, according to the company. The application also provides regional products like Korean face masks, or local brands. Cargo also shares limited user data with companies, such as which products were most popular, and what time of day they sold best. Though the company does service cities outside of L.A. and San Francisco, those are the two locations in which drivers can pick up their boxes directly from Uber hubs. The deal is also helping earn money for Uber, which will be amassing equity in Cargo over a multi year period during the partnership. Cargo declined to specify Uber’s exact stake. Are Human Stock Pickers Really Better Than Machines?